Brazoria County (/brəˈzɔːriə/ brə-ZOR-ee-ə) is a county in the U.S. state of Texas. As of the 2010 census, the population of the county was 313,166. The county seat is Angleton. Brazoria County is included in the Houston-The Woodlands-Sugar Land Metropolitan Statistical Area. It is located in the Gulf Coast region of Texas. Regionally, parts of the county are within the extreme southernmost fringe of the regions locally known as Southeast Texas. Brazoria County is among a number of counties that are part of the region known as the Texas Coastal Bend. Its county seat is Angleton, and its largest city is Pearland. Brazoria County, like nearby Brazos County, takes its name from the Brazos River. The county also includes what was once Velasco, Texas, which was the first capital of the Republic of Texas. 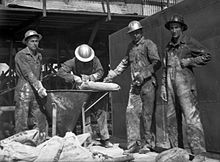 It served as the first settlement area for Anglo-Texas, when the Old Three Hundred emigrated from the United States in 1821. Brazoria County, like Brazos County, takes its name from the Brazos River, which flows through it. Anglo-Texas began in Brazoria County when the first of Stephen F. Austin's authorized 300 American settlers arrived at the mouth of the Brazos River in 1821. Many of the events leading to the Texas Revolution developed in Brazoria County. In 1832, Brazoria was organized as a separate municipal district by the Mexican government, and so became one of Texas original counties at independence in 1836. An early resident of Brazoria County, Joel Walter Robison, fought in the Texas Revolution and later represented Fayette County in the Texas House of Representatives. Stephen F. Austin's original burial place is located at a church cemetery, Gulf Prairie Cemetery, in the town of Jones Creek, on what was his brother-in-law's "Peach Point Plantation". His remains were exhumed in 1910 and brought to be reinterred at the state capital in Austin. The town of West Columbia served as the first capital of Texas, dating back to pre-revolutionary days. Temple Lea Houston, youngest son of Sam Houston, was c. 1880 the county attorney of Brazoria County. His life story is reflected in the 1963 film The Man from Galveston and the 26-episode 1963-1964 NBC western television series, Temple Houston. Lake Jackson is a community developed beginning in the early 1940s to provide housing to workers at a new Dow Chemical Company plant in nearby Freeport. The county has elements of both rural and suburban communities, as it is part of the Greater Houston. On June 2, 2016, the flooding of the Brazos River required evacuations for portions of Brazoria County. According to the U.S. Census Bureau, the county has a total area of 1,609 square miles (4,170 km2), of which 1,358 square miles (3,520 km2) is land and 251 square miles (650 km2) (16%) is water. As of the census of 2000, 241,767 people, 81,954 households, and 63,104 families resided in the county. The population density was 174 people per square mile (67/km²). There were 90,628 housing units at an average density of 65 per square mile (25/km²). The racial makeup of the county was 77.09% White, 8.50% Black or African American, 0.53% Native American, 2.00% Asian, 0.03% Pacific Islander, 9.63% from other races, and 2.22% from two or more races. About 22.78% of the population were Hispanic or Latino of any race. About 12.1% were of German, 11.2% American and 7.2% English ancestry according to Census 2000. About 79.0% spoke only English at home, while 18.1% spoke Spanish. Of the 81,955 households, 40.80% had children under the age of 18 living with them, 62.20% were married couples living together, 10.40% had a female householder with no husband present, and 23.00% were not families. About 19.10% of all households were made up of individuals and 6.40% had someone living alone who was 65 years of age or older. The average household size was 2.82, and the average family size was 3.23. In the county, the population was distributed as 28.60% under the age of 18, 8.60% from 18 to 24, 32.40% from 25 to 44, 21.50% from 45 to 64, and 8.80% who were 65 years of age or older. The median age was 34 years. For every 100 females, there were 107 males. For every 100 females age 18 and over, there were 107.4 males. The median income for a household in the county was $48,632, and for a family was $55,282. Males had a median income of $42,193 versus $27,728 for females. The per capita income for the county was $20,021. About 8.1% of families and 10.2% of the population were below the poverty line, including 12.6% of those under age 18 and 8.7% of those age 65 or over. As of the 2010 United States Census, there were 313,166 people residing in the county. 70.1% were White, 12.1% Black or African American, 5.5% Asian, 0.6% Native American, 9.2% of some other race and 2.6% of more than one race. 27.7% were Hispanic or Latino (of any race). The Brazoria County Jail is located at 3602 County Road 45 in unincorporated central Brazoria County, north of Angleton. Darrington Unit, near Rosharon - The Windham School District Region III office is within the unit. Wayne Scott Unit, near Angleton. Ramsey Unit - The unit is co-located with Stringfellow and Terrell. 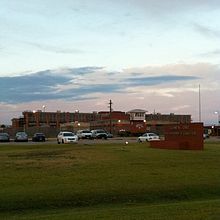 The TDCJ Region III Maintenance Headquarters is within this unit. Stringfellow Unit, near Rosharon - The unit is co-located with Ramsey and Terrell. The unit was originally named Ramsey II Prison Unit. C. T. Terrell Unit - The unit is co-located with Ramsey and Stringfellow. It was originally known as the Ramsey III Unit. In 2007, TDCJ officials said discussions to move the Central Unit from Sugar Land to Brazoria County were preliminary. Pearland native Kyle Kacal, a Republican from College Station, holds the District 12 state House seat based in Brazos and four neighboring counties. Alvin Community College and Brazosport College serve as higher education facilities. The Brazoria County Library System has branches in Alvin, Angleton, Brazoria, Clute, Danbury, Freeport, Lake Jackson, Manvel, Pearland, Sweeny and West Columbia, and runs the Brazoria County Historical Museum. The Texas Gulf Coast Regional Airport, in central unincorporated Brazoria County, is the county's sole publicly owned airport. The closest airport with regularly scheduled commercial service is Houston's William P. Hobby Airport, located in southern Houston in adjacent Harris County. The Houston Airport System has stated that Brazoria County is within the primary service area of George Bush Intercontinental Airport, an international airport in Houston in Harris County. The Brazoria County Toll Road Authority does not currently operate any roads, but will operate the new toll lanes on TX 288 inside Brazoria County after completion. The BCTRA has no toll roads in operation at this time. ^ "Robison, Joel Walter". Texas State Historical Association. Retrieved August 2, 2015. ^ "Mandatory evacuations ordered in Brazoria County". Houston Chronicle. 2016-06-02. Retrieved 2018-07-19. ^ "Sheriff's Office Archived September 15, 2008, at the Wayback Machine." Brazoria County. Accessed September 13, 2008. ^ "Region III Director's Office Archived January 25, 2010, at the Wayback Machine." Texas Department of Criminal Justice. Retrieved on January 8, 2010. ^ a b Lowman, John. "Talk of prison move preliminary." Brazosport Facts. Wednesday June 6, 2007. Retrieved on May 9, 2010. ^ Horswell, Cindy. "For hard-hit economy of Liberty County, crime officially pays." Houston Chronicle. Thursday June 29, 1995. A30. Retrieved on July 23, 2010. ^ a b Isensee, Bridie. "TDCJ makes overtime changes", Brazosport Facts, 13 August 2003, Retrieved 2010-05-09. ^ "CLEMENS (CN) Archived 2010-07-25 at the Wayback Machine." Texas Department of Criminal Justice. Accessed September 12, 2008. ^ a b Staff and Wire Reports. "Parts of Houston join evacuation," Houston Chronicle, 21 September 2005, Retrieved on May 10, 2010. ^ "DARRINGTON (DA) Archived 2010-07-25 at the Wayback Machine." Texas Department of Criminal Justice. Accessed September 12, 2008. ^ "SCOTT (RV) Archived 2008-09-24 at the Wayback Machine." Texas Department of Criminal Justice. Accessed September 12, 2008. ^ "Table of Contents and Excerpt, Trulson and Marquart, First Available Cell." University of Texas Press. Retrieved on July 16, 2010. ^ "RAMSEY (R1) Archived August 21, 2008, at the Wayback Machine." Texas Department of Criminal Justice. Accessed September 12, 2008. ^ "STRINGFELLOW (R2) Archived 2008-08-21 at the Wayback Machine." Texas Department of Criminal Justice. Accessed September 12, 2008. ^ Tompkins, John. "Ramsey unit renamed." Brazosport Facts. November 10, 2006. Retrieved on December 7, 2009. ^ "C. T. TERRELL (R3) Archived 2010-07-25 at the Wayback Machine." Texas Department of Criminal Justice. Accessed September 12, 2008. ^ Timms, Ed. "Uneasy about death row, Terrell wants name off unit Prison expected to be renamed." The Dallas Morning News. July 14, 2001. Retrieved on May 9, 2010. "Another prison the Ramsey III unit in Brazoria County probably will be renamed for Mr Terrell". ^ "Kyle Kacal's Biography". votesmart.org. Retrieved February 23, 2014. ^ "Master Plan Executive Summary Archived July 11, 2011, at the Wayback Machine." George Bush Intercontinental Airport Master Plan. Houston Airport System. December 2006. 2-1 (23/130). Retrieved on December 14, 2010. ^ "Brazoria County Expressway". Retrieved May 28, 2017. Wikimedia Commons has media related to Brazoria County, Texas.